Ridge House player Elise Mays runs the ball during the powder puff game Wednesday night. Ridge House took second in the competition and scored 106 points. Sugar Grove player Brianna Taylor rushes past Fulton Creek players to score a touchdown in the first round of the powder puff game Wednesday night. 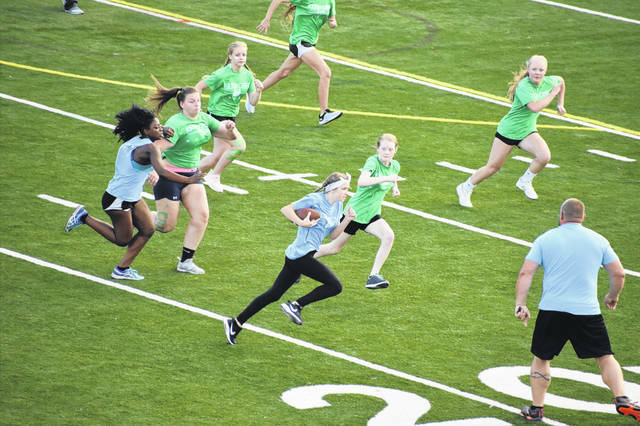 Sugar Grove, the returning champions, won the powder puff game after scoring 115 points. A Prospect Hill player catches a pass for a touchdown Wednesday evening during the powder puff game. Prospect Hill scored 29 points during the game and finished seventh. 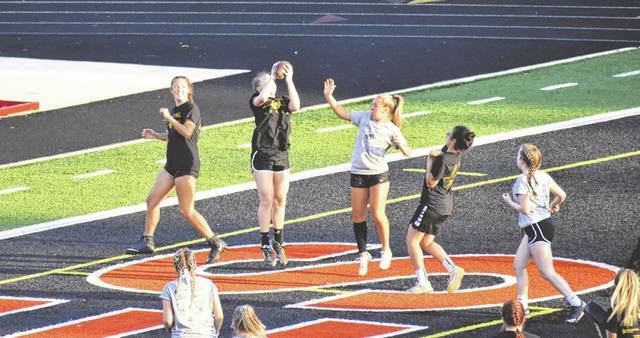 Cornell Stadium was a battleground Wednesday night as the eight Hayes High School House powder puff football teams squared off. Each house assembled a team that practiced every day during the house period for a couple of weeks before Wednesday’s game, where the houses were divided into two divisions and played the other three teams in their divisions until the two highest-scoring teams faced each other in the championship game. The two-hand-touch game was played in chunks of six minutes with teams spending six minutes on offense and six on defense. After the regular games, teams attempted field goals to put their score over the top and get them into the championship. Defending champions, Sugar Grove, took home first place with 115 points, narrowly beating Ridge House, who scored 106 points. Third place went to Fairview with 76 Points; fourth place was given to Fulton Creek with 62 points; Houk House took fifth place and scored 54 points; Lockport placed sixth with 52 points, Prospect Hill was seventh with 29 points; and Steamtown finished eighth with 14 points. Sugar Grove players Taylor McMillan and Hannah Halstead said they enjoyed their time on the team. 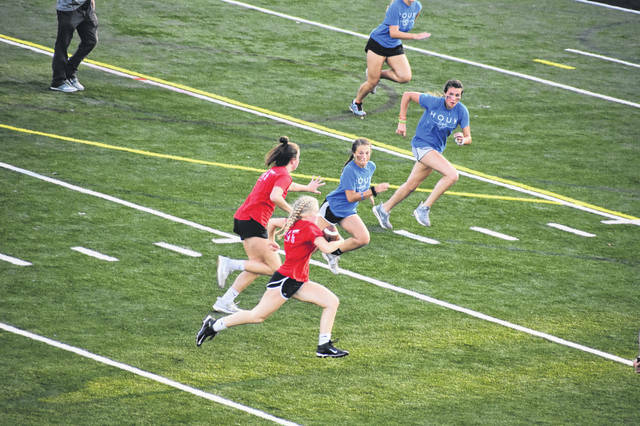 The powder puff game is just one of numerous athletic, artistic and academic challenges during the year as part of the contest for the House Cup, and Halstead said she would likely play on the team next year. Ridge House player Elise Mays, a senior, said she was happy to be part of her team. Hayes Principal Richard Stranges announced the game for the crowd of students and community members that came to the game. “When you talk about things that make a high school different, things that can’t be measured or are part of a test, it’s things like this,” Stranges said, gesturing to the students cheering on the sidelines for their teammates and waving flags. After the powder puff game, Fairview leads the competition for the House Cup with 21 points, followed closely by Ridge House and Sugar Grove, both with 20 points. Fulton Creek is in fourth place with 19 points; Houk is in fifth with 14 points; Prospect Hill is in sixth with 13 points; Lockport is seventh with 12 points; and Steamtown, the 2017 House Cup winner, is in eighth place with 10 points. The House Cup competitions will continue with various events and contests throughout the year, and it will culminate with the House Games in May.